Quail Tail Getaway is the perfect retreat for a relaxing weekend away for couples and/or extended family and friends. This classic, newly refurbished A-frame cabin offers all of the comforts of home with a fully equipped and newly remodeled kitchen. Sleeping quarters include three bedrooms and a sleeping loft. Two bathrooms have been newly refurbished - one upstairs with a tiled shower and one downstairs with a tub/shower combo. A fully equipped laundry room is an added plus for young families. The large living room fireplace encourages cozy conversations and the adjoining dining room can seat twelve guests. The panoramic deck provides magnificent views of the monolithic "red rocks" by day and fabulous star gazing at night. Located in uptown Sedona, within walking distance of restaurants, shops and hiking trials, Quail Tail Getaway is the perfect location for exploring red rock country including the Grand Canyon just two hours away. 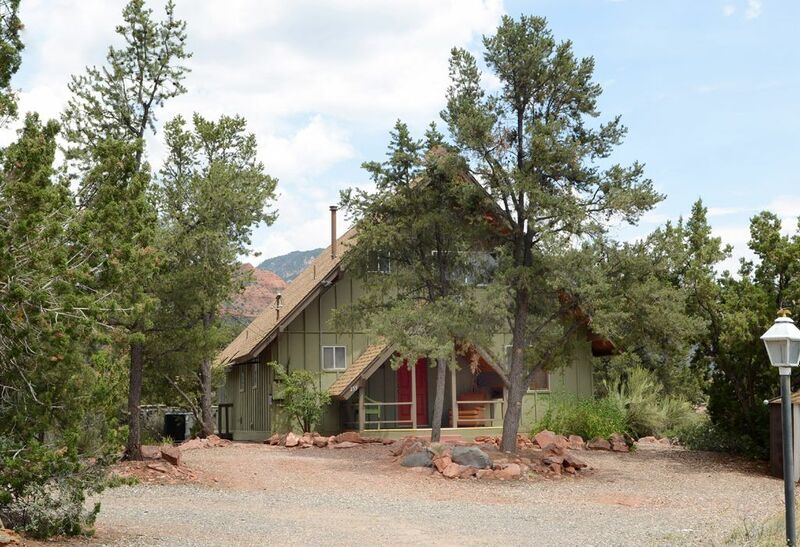 We love gathering our family including 6 grandkids in this wonderful cabin that was originally built by our Dad who was an orthopedic surgeon in Phoenix and he cherished his weekends away in Sedona just a 2 hour drive from Phoenix on the I-17. Sedona is a magical must do experience. The colors and the incredible energy here is addictive. Once you visit you will come back again year after year. Our cabin sits on top of Jordan HIll and you feel as though you are miles away from everything in this quiet location but it is just a 5-10 minute walk to Uptown Sedona and the shops, art galleries, and restaurants. Amazing trailheads are just a few minutes walk from the cabin. if interested in renting a 4 to 6 night stay please contact owner. Both Bathroom upstairs and down have been recently remodeled. Off the deck you have a 180 degree view of the red rocks. Just installed for your internet connection. Newly remodeled with cabinets/granite countertop, etc. Collection of Books on Arizona history, Art and Sedona area. Rustic cabin with years of family history overlooking the spectacular Sedona red rocks. Abundant wildlife. Easy 10 min walk to Uptown. Had everything we needed for our month long stay, kitchen basics, linens, etc. Great woodburning fireplace.Owner very responsive to any questions or concerns. We had a wonderful stay here, dead end street, edge of the canyon, breathtaking views! This is a wonderful place, has everything you need and is very comfortable. Arrived in the dark and when we woke up in the morning we were in awe of the view and just enjoyed being on the deck and taking it all in. Very comfortable, lots of room. Saw javalinas at the bottom of the road and they seemed very used to people. You also can walk to anywhere in town from here. Loved it. Very comfortable , deck was awesome , needed propane in tank , taken care of right away as we did cook at home some nights and mornings , everything stocked well . Easy walk to town . Lots of wildlife . Lots of room ! Great house and location. A beautiful view and so peaceful. Sedona is a beautiful place. We love sitting on the deck watching the humming birds and the stars at night. The house had everything you need. It felt like home and not a hotel room. A great place to stay. For renting for less than a week contact owner.